For Christmas Eve service, I preached on the Doctrine of the Incarnation. The opening analogy or insight being critiqued was simple- that Jesus came into the world as an addition, like Superman or Mork, an alien presence that comes into the world and makes it better as something added or additional to an already pre-existent and ongoing creation. I believe this is how Jesus Incarnate is generally preached and sung about at Christmas- the great baby on a visit. The great "what if" of a minority strand of theology makes a grander claim. Although I may not articulate it as concisely here as it might warrant, the basic insight is that just the reverse is true- that somehow the world and all of existence stands as it is precisely because of this incarnate One, Jesus Christ, the Logos. In the same way that Mary has her name because of the one she "bears"- Theotokos, so too all of creation groans in labor pains in preparation for the birth of this one, Jesus. This is to say that, rather than Jesus coming to be a part of creation as an addition, all of creation comes into being so that there might be this one, Jesus. Stated existentially, it is not that we are going on, living as we are, and then Jesus comes into our lives to add a religious dimension; rather, we live and move and have our being in and for Him. Universes and galaxies exist so that this child might be born. This in no way diminishes the value of universes and galaxies, as if their only value is their utility. Rather, they are beautiful and stellar (pun!) precisely as they are and are so because in this way God speaks God's very self into begottenness in and amongst it. The portions of stars that make up our bodies also make up Christ's earthly body, and are incorporated somehow into the resurrection, by way of death. This may be how we can speak of all of creation as cruciform, because it all partakes of this path that Jesus takes, from life through Christ's death as the first born from the dead into resurrection life. All of this is worth much time and reflection, but one piece of the puzzle I've never seen addressed- how do we speak of the Incarnate Logos as the one through whom all was spoken into existence. That is, does the Christ somehow participate in His own begottenness. Or is this an example of the dictum that the works of the Trinity are ad extra indivisible/indistinguishable? One question my psyche compels me to ask people each December is, "What was the best book/CD/movie of 2006?" It's proof that I inhabit a media-saturated world. I confess, the first section of the NY Times I read after the front page is book review, and then sometimes Arts & Leisure. I'm a sucker for the indie music and movie complex, and books, well, they're like water for a fish for our household. Best movie of the year: The Death of Mr. Lazarescu. We saw this at the Wisconsin Film Festival last year. Mr. Lazarescu, a 63 year old lonely Romanian man feels sick and calls the ambulance. When it arrives the doctor decides he should take him to the hospital but once there they decide to send him to another hospital and then yet another... As the night unfolds and they can't find a hospital for Mr. Lazarescu, his health starts to deteriorates quickly. He dies. The movie is riveting from beginning to end. Best CD: The two disc set by Jonathan Rundman, Protestant Rock Ethic. Especially the 7 songs of his Heartland Liturgy, and a son we sing to our son all the time, Hey Hey Samuel. Best book: Lay of the Land by Richard Ford, although I almost said The Road by Cormac McCarthy. Best theological volume: Peter Leithart's commentary on 1 & 2 Kings. For those of us preparing both for Sunday morning (Advent 4) and Sunday evening (Christmas Eve), I suggest meditation these next few days on music and art. Depictions of the Visitation are especially helpful, as they help our devotions in the days before the nativity. This piece by He Qi, for example. Then, what I've been doing is listening to musical renditions of the Magnificat. Bach, and also Kent Gustafson's version in his Mountain Vespers. It's amazing to simply imagine that the church has been praying this prayer each evening, and the Benedictus each morning, for over 2000 years. That almost preaches all by itself. I wonder why it is that setting a song like this to music often has the effect of vacating it as proclamation? Do we listen to music as if it preached or prayed twice (Augustine)? What is it peculiar to music that sets it in our hearts differently than the word unsung? Or what is it about our culture that has made it so. May these songs, all these carols and hymns, preach the Word made flesh. On the Epiphany of Our Lord, January 6, family and friends (C for "community") gather at the main entrances to homes or apartments (nursing home quarters, extended care facility, hospital rooms! ), and ask God's blessing on their dwellings and on all who live or visit there. You are invited to use this in your own home, or visit your loved ones and use it there. Leadership may be shared with a change of voice at each Leader's part (L). L Peace be to this house and to all who enter here. L A reading from Proverbs: "By wisdom a house is built, and through understanding it is established; through knowledge its rooms are filled with rare and beautiful treasures." 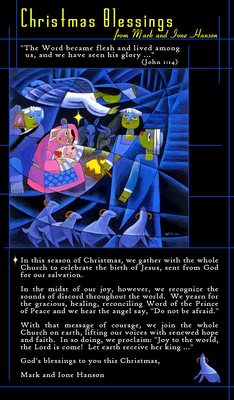 L Let us pray: Gracious God, as a shining star once guided the magi to the birthplace of the infant Jesus, so enable those who dwell here to be your light in the world; through Jesus Christ we pray. Using chalk (hence, "Chalking the Door"), people are invited to inscribe the lintel of the home (the horizontal frame above the door) with the inscription shown below. The letters C M B come from the traditional (9th century) names for the "three kings" -- Caspar, Melchior & Balthazar. Some also suggest "Christus Mansionem Benedicat" which means "May Christ bless this dwelling!" L A reading from Isaiah: "The effect of righteousness is peace, and the result of righteousness, quietness and trust forever. My people will abide in a peaceful habitation, in secure dwellings, and quiet places." People may join hands or extend their hands outward and upward (orans) for the prayers. L Let us pray: Sovereign God, we pray that you will bless this home and all who live here with your gracious presence, that your love may be our inspiration, your wisdom our guide, your truth our light, and your peace our benediction; through Jesus Christ we pray. People may make the sign of the cross in remembrance of their baptism. L May the Lord watch + over our going out and our coming in, from this time forth and forevermore. Just in time for the holidays and the New Year, Lutheran Confessions will be hosting book reviews and comments from a guest reviewer, whose eponym will be "Books of Concord." As an Advent update, the reading plan is going well. Putting structure around what I read when has helped shape how I read. I don't look through a stack of books wondering what I'll read next. Instead, I'm making my way back and forth from 1 & 2 Kings to Leithart's commentary, reading close and slow. Instead of reading being a desperate attempt to stay current and on top of "the reading list," a topic on which Qoheleth has a few things to say, I'm really living in one rich text. I might also mention that I decided that my day off, Friday, was not subject to the Advent discipline. So I'm reading Richard Ford's The Sportswriter , in the hopes of reading his new Lay of the Land over the Christmas holiday. In the previous chapter  we saw that the temple provides a useful entrée into ecclesiology, but a temple ecclesiology exists only because Christ himself is the human temple of Yahweh (John 2:21). First Kings 8 provides a starting point for a templar Christology. This is the first book I've read in a very long time that I read and am enriched theologically and spiritually at the same time, as if devotion and study were two sides of the same coin.